The first time I had a really great paella was in Majorca Spain, where every kind of seafood available could be obtained freshly caught, having never been frozen. The flavor and texture is incomparable to our once frozen varieties. The shrimp and baby squid quite literally melted in my mouth. My Uncle Nick had an apartment there in town over looking the marina. Two friends of mine and I were visiting with him for the Christmas and New Year’s holidays. He prepared for us an incredible paella, taking no short cuts, making his stock from scratch. 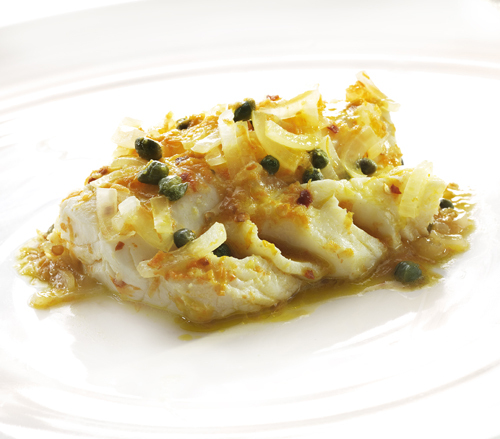 In my version, seen above, I did my best to recreate the flavors and textures I remembered from Spain. 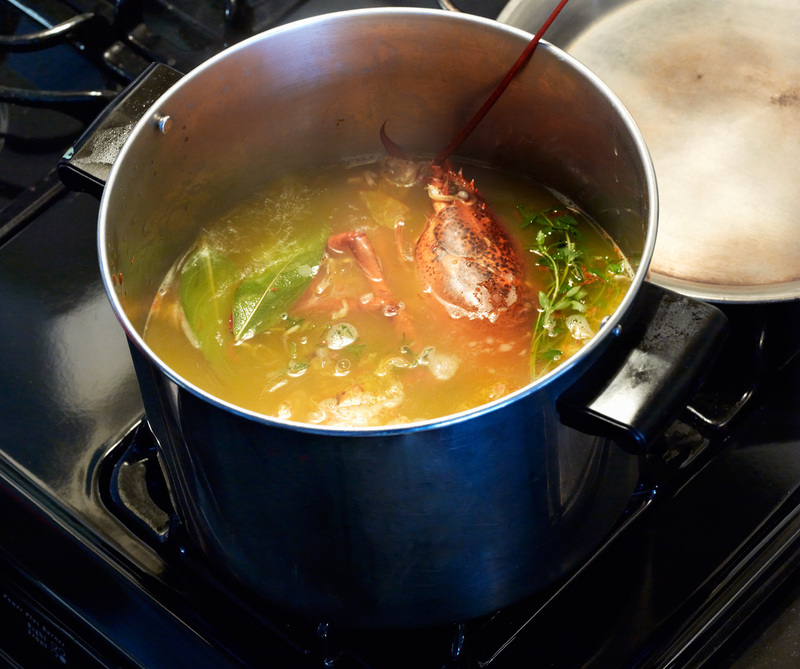 I did take a tiny short cut in buying organic free range chicken stock and clam juice, which I enhanced by boiling it down with chicken wings, a lobster head, shrimp shells, a whole carrot, onion and celery stalk, a couple of bay leaves, a few sprigs of thyme, and a pinch of saffron. My photographer friend, David, and I went to a Spanish Restaurant in NYC, El Charro Español, which specializes in paella while we were researching to write and shoot this post, and help me come up with my recipe. I ordered the seafood paella and he ordered the Paella Valenciana, which also included seafood and featured chicken and chorizo, a smoky, spicy sausage. I usually don’t eat pork products due to the high Triglyceride levels, but when I tasted what a difference it made in the flavor of David’s rice compared to mine, I was sold on chorizo in paella as a must. We borrowed a paella pan with the generosity of Luis, the owner of the restaurant. I am told that the pan can make all the difference, but that the most important thing is the proportion of the broth to the rice, and of course the flavor of the broth. 1 small live lobster-remove the head and small legs for the stock. Cut the tail into 1 inch pieces, leaving the shell on. 4 chicken wings, browned on both sides in plenty of canola oil in a skillet-use 2 for the stock. 12 tiny clams, scrubbed and sorted to ensure that they are alive (I prefer Cockles. They are ridged and have a green tint). 1/2 lb. medium shrimp- use the shells for the stock (and heads if you can get them that way). 1/4 lb. small mussels, scrubbed and sorted. 1 eight inch chorizo sausage-sauteed in the same pan with the chicken, then cut into 3/4″ inch thick rounds. 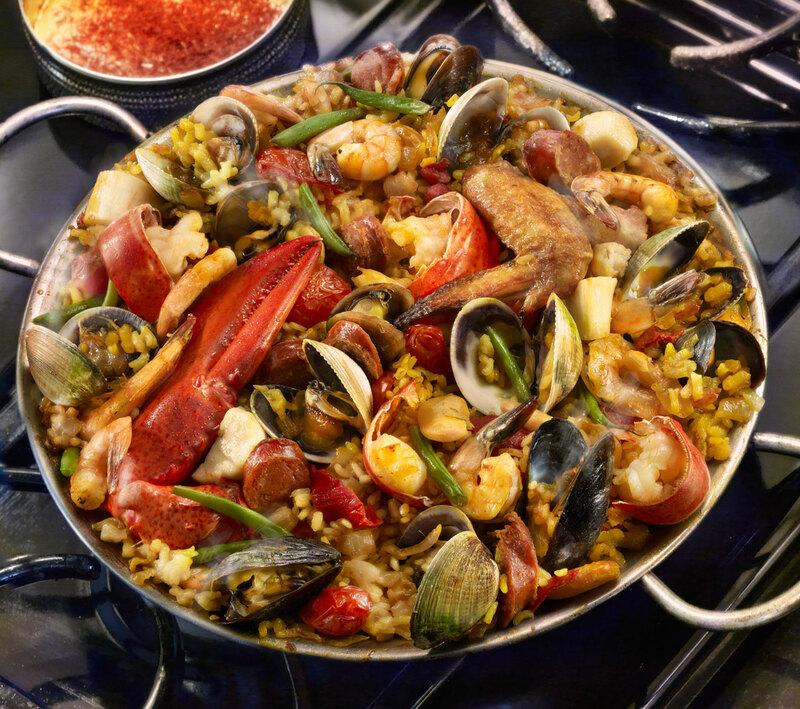 Prepare the seafood and refrigerate until you are ready to put them into the paella pan. Set aside the cooked chicken and chorizo. Boil the broth ingredients until it reduces to about half of the volume, or until you need to use it. Strain out the bits and discard them. Continue cooking the rice blend for about 5 minutes, stirring all the while. As the rice gets a bit thicker, start adding in the proteins from the largest to the smallest, nestling them into the rice mixture. Place the paella pan on the bottom shelf of the oven. Bake for about 20-30 minutes until most of the broth is absorbed, and the rice is just bit al dente. Cover and let rest for about 10- 30 minutes before serving. Having a crusty bottom is considered a good thing. It adds flavor and depth to the dish. Serve with lemon wedges and white or red sangria. Also visit my Food News column The Huffington Post and my professional website at marilinda.com. Marinating fish, whether whole, filleted, steak cut or chopped, is one of the tastiest ways to take advantage of seafood’s sweet and tender flaky flesh. 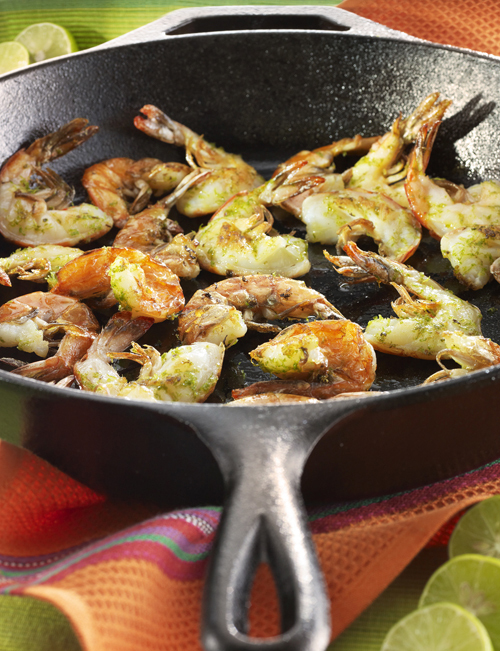 Marinades not only impart flavor to food, they preserve moisture and tenderness. 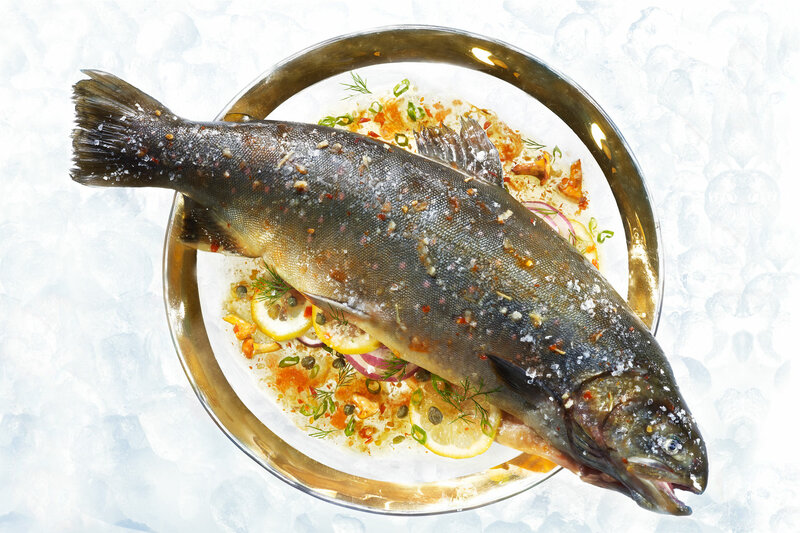 Add delicate vegetables and herbs to a palette of sweet, savory, salty, spicy and acidic liquids and seasonings to a fish filled oven proof covered baking dish, and bake gently for a foolproof ragoût de poisson. Pictured here, the Arctic Char, vegetable and marinade presentation is being readied for the baking dish and oven. The beautifully colored whole fish was scaled and cleaned by the fish market, leaving the head and tail on for an elegant service. The cavity is stuffed with thinly sliced lemons and red onions for flavor and color. I have been told more than once that this combination of fish, marinade and condiments is one of the best ever tasted. The marinade is a blend of high quality Mirin (Naturally sweet Japanese sake wine-Avoid using the cheap artificially sweetened corn syrup imitation), soy sauce, olive oil, toasted sesame oil, and Sambal Oelek Ground Fresh Chile Paste & Siracha Hot Chili Sauce (Chinese pepper vinegar preparations available in the Asian section of your grocery store). For amazing dazzle, sprinkle with sliced scallions, slivered fresh ginger, capers, dill, baby Funnel Chanterelle mushrooms (also known as yellowfoot or winter mushroom) and Maldon Natural Sea Salt Flakes. If you don’t have a lid for your baking dish, cover the fish with a sheet of parchment paper and seal the dish with aluminum foil. I don’t like to let the foil touch the food to avoid adding aluminum residue, especially when acid is present in the food. One fresh whole cleaned 3-4 Lb. fish with head and tail; Arctic Char, Salmon, Bass, Grouper, Snapper, etc. Bake for about 20 minutes for a larger fish and less for a smaller fish. Do not over cook. The fish should be just flaky and moist.